Spanning the 300 years between the Act of Union and the re-establishment of the Scottish parliament, this history covers all the factors that go to make Scotland what it is today. 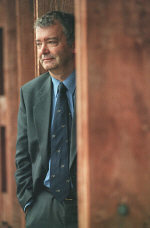 Devine charts the uneasy relationship between Scotland and England, focusing closely on the growth of Scottish ideas of independence and self-rule and he uses extensive original research to examine Scotland's urban vigor as well as describing the traditional aspects of Scottish history, covering key topics such as the Union, the Enlightenment, Industrialization, the Clearances, Religion, and the Road to Devolution. He also explores the global Diaspora of the Scots, the impact of migrants, and the effect of the World Wars. Throughout, Scotland's story is set against the background of British, European, and world history. "Outstanding...Scottish history has been waiting a long time for a counterpart to Roy Foster's masterpiece of revisionist synthesis, Modern Ireland,...Devine has written it." 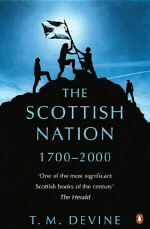 "Magnificent...a high achievement, a history of modern Scotland which rarely for the subject, endows with sweep and powrr the changes that have created the country we live in." "A formidable work - a serious attempt to describe within one set of covers the complex and troubled history of modern Scotland...the range of the book is quite remarkable." "Both the sweep of the issues and the depth of the analysis, particularly the impact of change on the lives of ordinary people, make it one of the books. It will certainly be one of my books of the year." "One of the most significant Scottish books of the century. " "A fiercely intelligent account of Scotland…Devine is the country’s most prominent historian, and from the evidence of this book, rightly so." "The work of a compendious historical mind. In it, you can smell the stink of the nineteenth-century Glasgow slums…hear the disputations of the Enlightenment scholars…the first history of Scotland which both a nationalist and a unionist Scot can keep on their shelves with pride , and that is a large achievement in itself. "